Wherever it happens, new research suggests that all that sitting and waiting is exposing us to more pollutants than we’d take in if were we cruising along. Researchers at the University of Surrey in England took to the streets of Guildford, “a typical English town,” to look at the effects of traffic on concentrations of polluting particles. They also analyzed how ventilation settings changed those concentrations inside of cars. The scientists took their measurements inside a car as it traveled on a six-kilometer loop, passing through 10 traffic intersections. They tracked the concentrations of different-size particles of air pollution — ranging from course to fine — at each intersection. 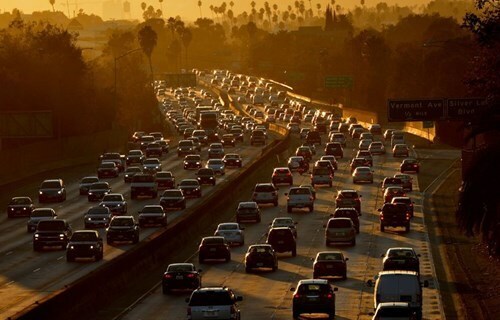 In a car stuck in traffic, shutting all the windows and turning off the fan or heat reduced concentration doses of the smallest, most hazardous particles by up to 76 percent. And while they were only at traffic intersections for about 7 percent of total commuting time on average, the time accounted for as much as 10 percent of their exposure to harmful particles. The exposure was more than six times greater in cars with open windows than for pedestrians at three- or four-way intersections. So when you’re stopped at an intersection, roll up the windows, and breathe easier.